This charming 1 bedroom, 1 bathroom condo with an extra sofa sleeper in the living room is nestled within the main basin of Killington, close by popular local attractions like Killington Golf Course, Killington Snow Tubing Park, Killington Adventure Center, and Killington’s Snowshed Lodge and ski lifts. Take the free shuttle from the resort into town for après ski nightlife and dining, or visit Killington Peak for skiing, snowboarding, hiking, mountain biking, horseback riding, and more throughout the year. Other activities you can enjoy nearby include tennis, canoeing, kayaking, ice skating, snowshoeing, shopping, and antiquing. 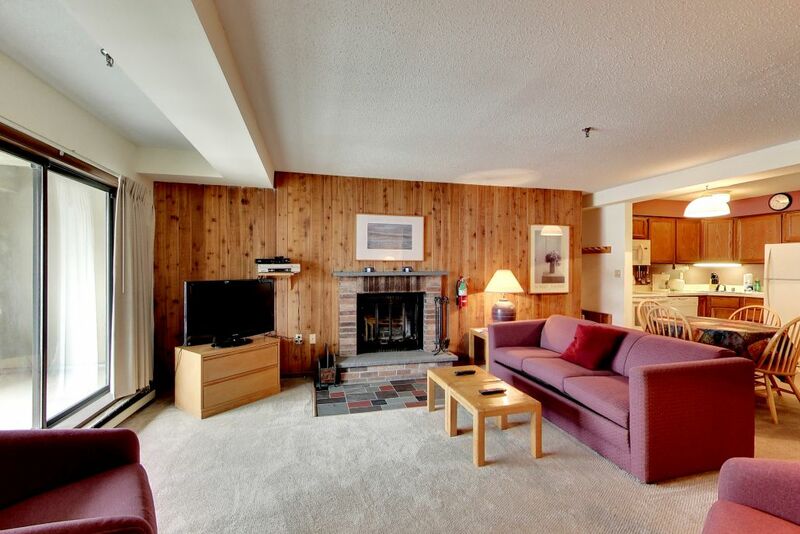 Inside of this condo and within the resort, you and your guests can enjoy spacious accommodations and convenient amenities. This property comfortably accommodates 2-4 people with its open layout, spacious bedroom and living room, and its full-sized gourmet kitchen outfitted with top-of-the-line appliances: an updated refrigerator, dishwasher, oven, and microwave. Dine in this condo and save time and money, whether you prepare a homemade feast for your guests or you reheat your leftovers from one of the delicious Killington restaurants close by. The condo and community provide plenty of amenities available for downtime relaxation between exploring what Killington has to offer. 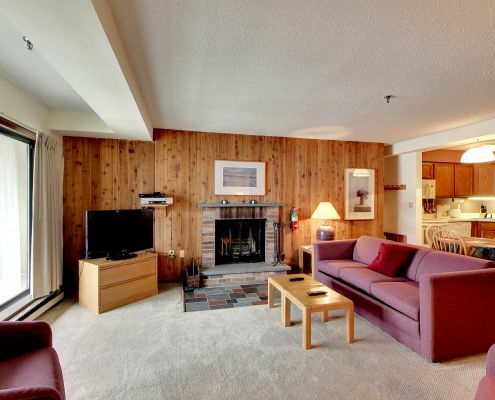 Snuggle up next to the fireplace in the condo while enjoying cable TV shows or movies or Wi-Fi. Or take advantage of community amenities like the onsite restaurant and bar, arcade, or the Black Dog Ski Shop for equipment rentals. The restaurant and bar normally have hours of operation from the week of Christmas through the end of March, with varying dates and times. Your stay in this condo also includes complimentary membership to the resort spa and its host of features. Soak your cares away in one of the two hot tubs, swim a few laps in the 54-foot heated indoor pool, or kick back in the sauna or eucalyptus steam room. Alternatively, you can keep up with your regular gym routine using the full gym with cardio machines and a weight room, a locker with showers, and a racquetball court. The hot tubs and indoor pool at the resort spa are open beginning Thanksgiving weekend and ending Easter weekend, with dates and hours subject to change. Housekeeping Description The condo is professionally cleaned and inspected by our inspectors prior to your arrival. Stays longer than 5 days, towel refresh is included. Other Amenities The indoor pool and hot tub are open Thanksgiving weekend through Easter weekend, we cannot guarantee dates and hours of operation. The onsite restaurant and bar are usually open Christmas week through the end of March, we cannot guarantee dates and hours of operation. Yes, there is exercise equipment, whirlpool spa, central sauna, central indoor pool, shuttle, restaurant and bar, game room.